Let’s be clear: I am an avid, die-hard, unreasonably loyal Dermalogica fan. There are one or two products that don’t work for my skin type, but – overall – I am a huge fan of this brand and recommend it to anyone who’ll listen. 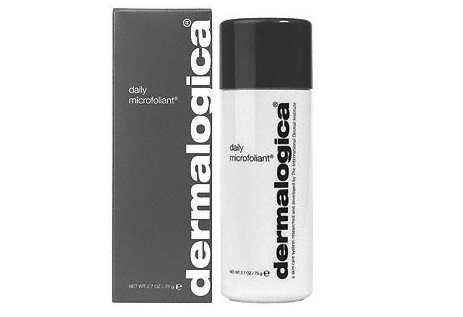 Having gotten that out of my system, my favourite Dermalogica product is hands-down the Daily Microfoliant. As the name says, this exfoliating powder is gentle enough to be used daily. Simply mix half a teaspoon with some water to create a deliciously soft and crumbly exfoliating paste, lathering it onto skin in circular motions, leaving it to work for a minute, before rinsing off. This skincare wonder leaves skin instantly smoother and brighter, ready to soak up your daily moisturizer. Each time I use this product, my boyfriend comments on how good my skin looks. This is a particularly great product to use (always on a cleansed face) after long-haul flights when your skin needs a serious polish.